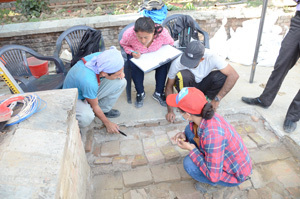 As part of the above-mentioned project commissioned by the Agency for Cultural Affairs, we conducted an excavation survey around Shiva Temple in Hanumandhoka Palace in Kathmandu from June 2 through 22, 2017. This survey was jointly implemented by the Department of Archaeology in Nepal and the Tokyo National Research Institute for Cultural Properties. Shiva Temple, which is said to have been constructed in the 17th century, is an about 5 meters square multi-storied tower. However, due to the 2015 Gorkha Earthquake in Nepal, its upper structure completely collapsed with the brick-stacked podium remaining. This survey mainly aimed to confirm the composition and the condition of the podium foundation to support the weight of the upper structure before its restoration. As a result of the survey, we found that the podium foundation was a large brick-stacked structure approximately 180 cm deep from the current surface, which maintained a stable condition. In addition, we also discovered the lower podium buried in the surrounding ground. Thus, there is a possibility that this Shiva Temple may have undergone more complicated processes than originally expected. 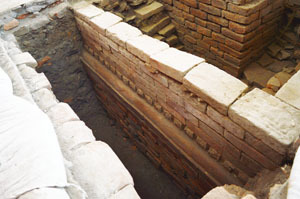 During the excavation survey, Nepalese and Japanese experts also exchanged opinions on the methods of measurement and photographing the remains. We are thinking of sharing more technical information between the two countries while continuing the academic research toward the complete restoration of the collapsed historic structure.